The apartment has 3 rooms and a bathroom, all of them with windows offering views of the 'sierra' (mountain range). The first (and biggest) room is the living room/kitchen, which has a large sofa, several chairs, a dining table and a television. There is no lack of details here, with a marble worktop, a sink, a microwave, a vitro-ceramic cooker, a freezer, both high and low storage spaces for storing food, and kitchen utensils. The bedrooms sleep 2 and 4 respectively. The first one is fitted with a large double bed; the second one has two bunk beds, sleeping 2 people each. Both of the bedrooms have spacious fitted cupboards and windows towards the outside. The bathroom is completely equipped. It has a washbasin, a bidet, a bathtub with a matted crystal screen and all you could need for storing bath towels and bath accessories. Above the door, there is a self-contained heating. Just like the other rooms, the bathroom has a window towards the outside. All of the components in this property are high quality. All doors are perfectly finished to avoid airflows when they are closed. The same goes for the windows, which are isolated from noises and outdoor cold. The modern heating system installed in all of the rooms assures an optimal temperature at any moment of the day: this will make your stay even more comfortable. The apartment is, without any doubt, ideal for having an unforgettable holiday. The building also provides a garage and ski storage area. The heated pool, sauna, and hot tub are located inside the building. My name is Carlos Baca. I live in Malaga, where I study audio-visual communication. I have been renting our apartment on Homelidays for 5 years now. We like to ski, so the Sierra Nevada really has always been a part of our history. For this reason, we bought the apartment, which lies at a prime location next to the chair lift. It also has a swimming pool: very important for relaxing the muscles afters skiing. My elder siblings work in Madrid, and my younger brother and I work and study in Malaga. We do not have time to ski as much as we would like to, which is why we rent our house when it is unoccupied. We are a family of skiers and we love the Sierra Nevada. We rent our apartment when we are not using it; this helps us to maintain its optimal condition. For its location along the chair lift, there is no hassle with dragging along your skis. It is sunny and south oriented. Spectacular, large, indoor swimming pool with sauna and hot tub, and views of the crystalline ski resort. Just what we had expected. Clean, tidy and comfortable. The owner, Carlos, was in frequent contact to make sure everything was right for us and agreed a late departure to allow a half day sking before leaving the resort. We enjoyed the living space in this appartment and felt very welcome in the building. The swimming pool and jacuzzi were excellent. First of all, I would like to say the owner is very accommodating and helpful and kept in touch by email throughout and returned the security deposit in a timely manner. However, I was disappointed in the property, it was smaller than I expected, I would say it was adequate but it was not a comfortable stay. The kitchen area is very small and not very well equipped if you want to cook every day. The apartment was extremely cold when we first arrived, and the first night we sat with blankets round us to keep warm! The TV is Spanish only channels, and my Spanish is not very good, so it would have been nice to have a DVD player or some other form of entertainment - no books or games supplied. The double bed in the main bedroom is a small double bed, and due to lack of space one person has to climb over the bed to get into it! 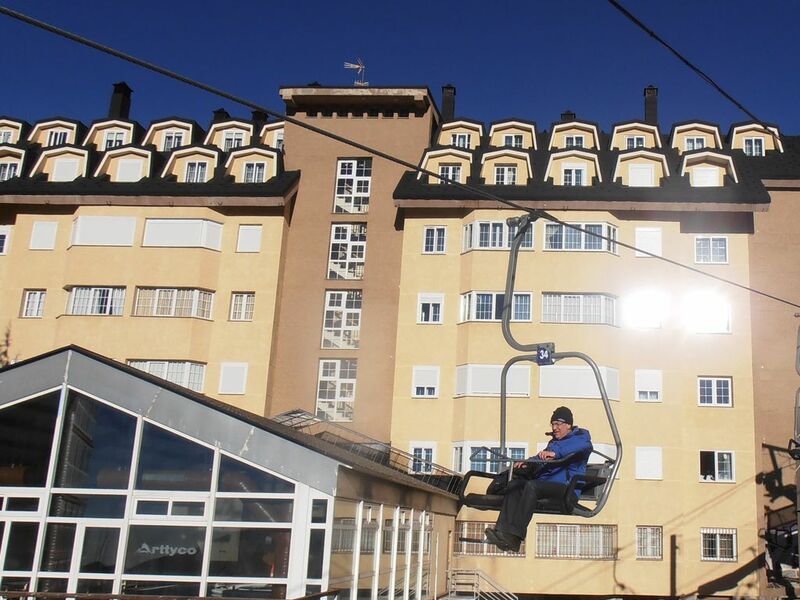 It was very convenient to have the ski lift right outside the apartment block. This block is more suitable for young people, as we found it very noisy at night, I was woken several times by people coming back in the small hours of the morning, as late as 3.30am, talking very loudly, laughing and generally being very inconsiderate, we complained twice to two different apartments, one next door and one upstairs. I am not sure what the smoking rules are in Spain, but it was obvious that people smoke in the building which could plainly be smelt. The hot water tank is quite small and didn't supply enough hot water for the 3 of us in the morning. The apartment looks a bit tired and could do with some new dining furniture and sofas. We didn't use the pool, but had a quick look and it looked very nice and a very reasonable price. Ubicación estupenda. Tamaño muy justo para 5. En general muy recomendable. Echamos de menos más toallas. Solo 1 x persona , quizás 1 pequeña mas x huésped estaría bien. Muy de agradecer el aceite, la sal ,el azúcar y el café. Esos detalles están genial. El apartamento en sí está bien, pero no cumple lo que promete en cuanto a los servicios anunciados, en concreto el de la piscina/jacuzzi. Contraté este apartamento (y pagué de más frente a otros), precisamente por la piscina y el jacuzzi, ya que me hacía ilusión darles esa sorpresa a mi familia despues de esquiar. En ningún día de mi estancia hubo forma de hacer uso, sin obtener solución válida por parte del propietario. Que si mail para acá y para allá entre el propietario y la comunidad, y al final, imposible. Creo que todo se resume en que el propietario no asumía las normas de la comunidad, y estaba tratando de echarles un pulso, sin importarle lo mas mínimo su contrato y compromiso conmigo. En plena "crisis de acceso", llamé al propietario, y no dió la cara...ni durante, ni después. De haberlo hecho, me ahorraría esta valoración, a pesar de un "disgustillo tonto"...que me ha terminado por aguar las vacaciones. Aconsejo sin duda buscar otras alternativas. Nos alegra que les haya gustado el piso. Pero bueno supongo que cuando todo lo dan tan fácil siempre hay tiempo para encontrar defectos. Espero que pudieran disfrutar del resto de actividades que ofrece Sierra nevada ya que no pudieron tener la piscina por problemas que escaban a muestro control. Saludos y espero que vuelvan cuando quieran. Dice estar a 100 metros del telesilla pero ese no es el telesilla qué sube a las pistas. Muy buena ubicacion. Estupendo el apartamento. Nos ha gustado mucho el apartamento. Me gustaria destacar varios aspectos: La ubicacion (sabiendo que esta en la parte media de la urbanizacion) es buena ya que esta a escasisimos metros de la primera parada del telesilla. El apartamento incluye plaza de aparcamiento, y esto en Sierra Nevada es una gran ventaja; dinero que te ahorras de pagar un parking. La distribucion del piso esta muy bien para un grupo de entre 4-5 personas. Me sorprendio gratamente el gran numero de detalles que habia en el apartamento: aceite, sal, azucar; y capsulas para preparar cafe. Otra de las cosas a indicar es que dentro del edificio hay una piscina cubierta. Despues de esquiar da gusto poder darte un baño. En resumen, una estancia estupenda. Muchisimas gracias por el comentario! Nos alegra mucho que les haya gustado tanto. The Sierra Nevada ski resort (only 25 minutes away from Granada) is situated at the end of the Monachil community border; it can be reached over the highest road in Europe. With three both national and international airports (Granada, Malaga and Seville), a train station and a bus station nearby, Granada is a perfectly interconnected city. Nowadays, thanks to a modern motorway network, we are less than 4 hours away from Madrid. La Ruta del Veleta (luxurious) and Pizzeria Tito Luigi are, among several others restaurants, only a few metres away from the house. The apartment is situated near nightclubs, small food and beverage shops, and so on. Access to the chair lift nearby. Depósito como forma de reserva, reembolsable al dejar el apartamento, entrega de llaves realizada por propietario ausente que podría estar ausente durante la estancia, pero siempre con contacto telefónico y con el apoyo del portero para solucionar cualquier problema.